As always, I’ve been cooking my fool head off! One meal we cook often is Pernil. My family loves Pernil and it is so easy to make especially since I didn’t grow up with this type of cuisine. For those who aren’t aware, my darling babydoll is Puerto Rican. 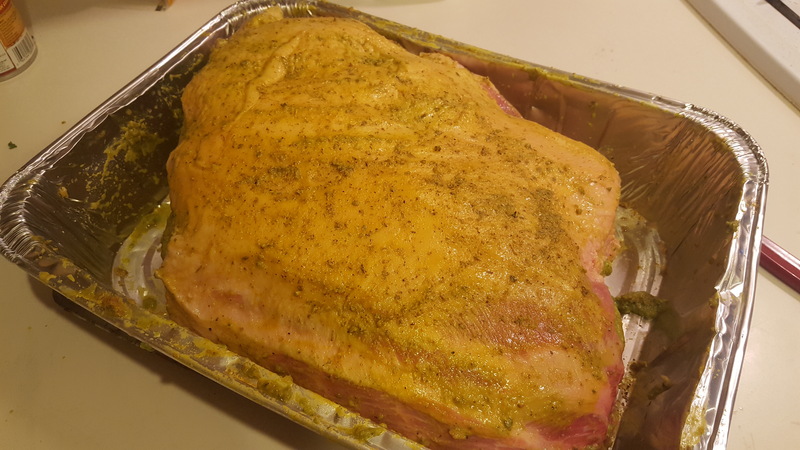 It is a marinated pork shoulder that is slow roasted in its own juices and is commonly made during Christmas time. It is traditionally served with a side of arroz con gondules which is rice with pigeon peas. 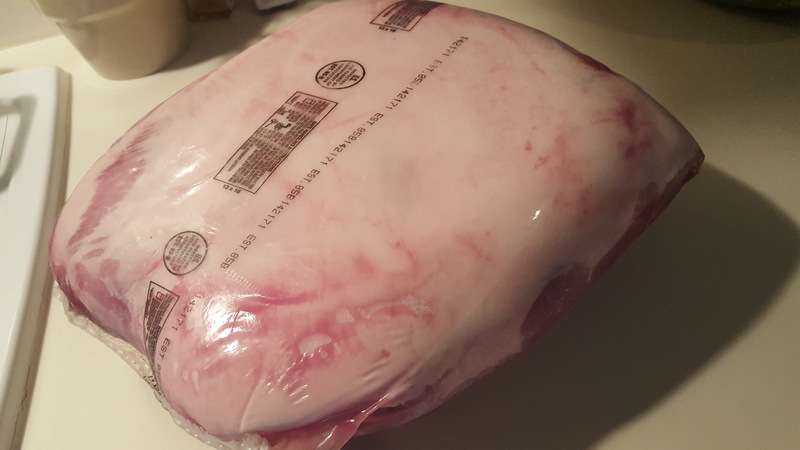 The pork shoulder is used as a whole piece, with the skin and the bone. Now recipes will differ per family and by region in Puerto Rico. Every grandma and mother has their own way of making it and is the kind of recipe that sets them apart. Try asking for their recipe and you will find they will take it to the grave. I adapted this recipe for my families tastes but the basic concept is very much the same. 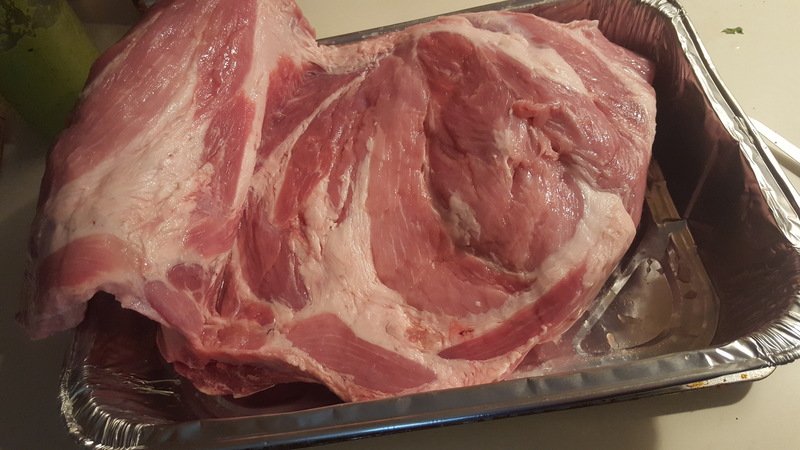 The pork shoulder will come with a thick layer of fat on one side that offers “the best” flavor. Puerto Ricans use every part of their meat which in this case includes the fat. This fat after the Pernil is done, is a form of chicharron or crispy pork skin that is popular among the Spanish and Latin Americas. Once the meat is cooked, it can be used a major component in a lot of Spanish cooking in things like empanadas, tacos, breakfast burritos, and pressed Cuban sandwiches. Rinse the pork shoulder with cold water. Splash apple cider vinegar all over the meat to cleanse and kill any surface bacteria. Dry the meat thoroughly so the seasonings will stick. Cut the thick layer of fat separating it from the actual meat being careful to leave one side attached. This flap of fat will turn into chicharron. 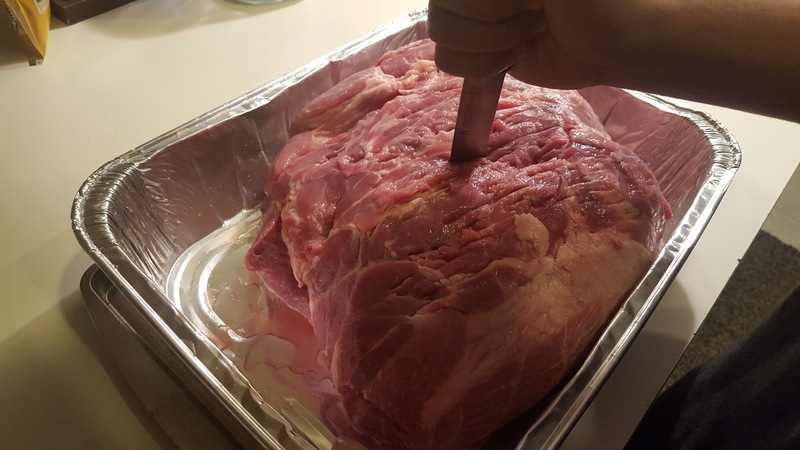 Stab the meat (not the fat) with a sharp knife to enable the Sazon and Sofrito to penetrate. This is a fantastic step if you have had a hard day! Stab away! In these holes, put whole cloves of garlic. Rub on Sofrito to taste. If you love strong flavors of cilantro and garlic simply add more. Next, rub 2 envelopes of Sazon or make the recipe below and use 2-3 tsps. Massage the meat, getting in all of the nooks and crannies and put in a large baking pan. You can use a disposable aluminum pan or a large roasting pan. 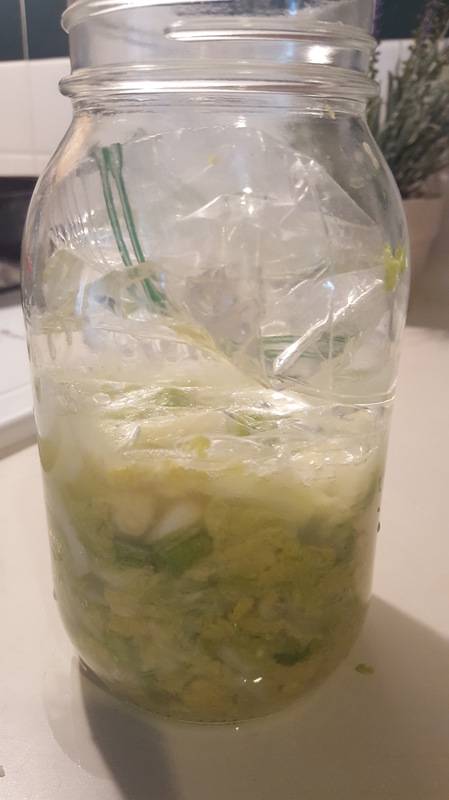 It will generate its own juices so there is no need to add additional liquid. 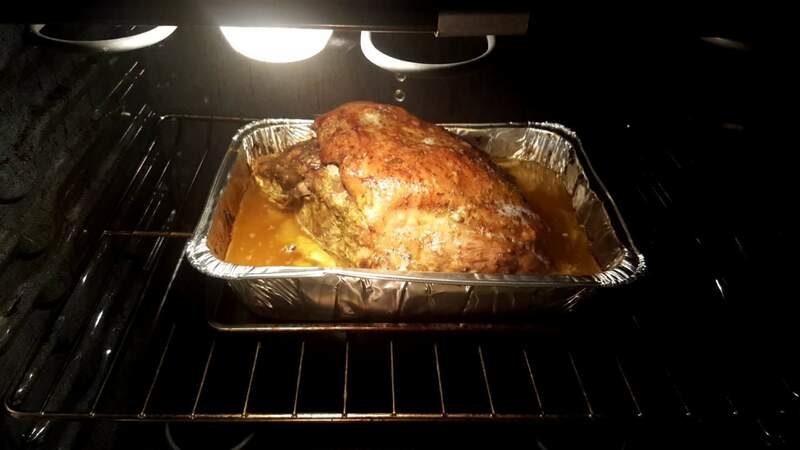 Cover tightly with aluminum foil and refrigerate for two days. There is a lot of meat to penetrate, so marinating for two days will give the most flavor. Bake at 350 degrees on a lower rack for 3 hours covered and 3 hours uncovered. You can gauge cooking time after this point depending on the size of the pork shoulder. If you want crispy skin, it may or may not need a few extra minutes to make it really crispy. 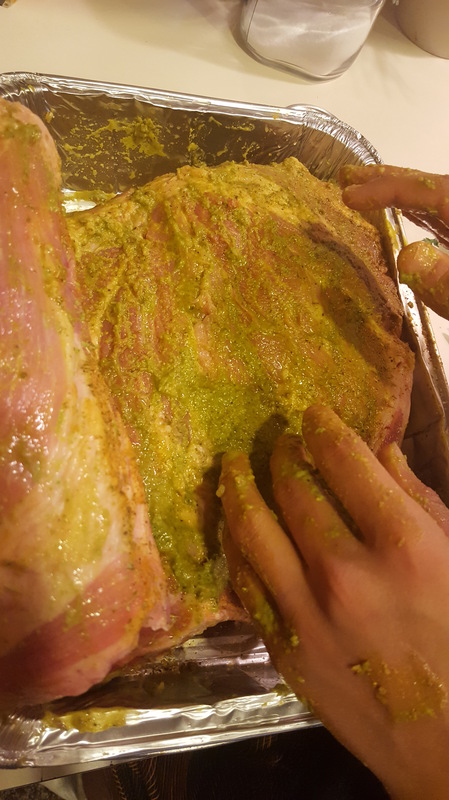 You will know when the Pernil is properly cooked if the meat falls from the bone without effort. It will shred. If you love Spanish flavors, you cannot go wrong with this seasoning blend. They do sell Sazon in the store, but this homemade version is free of preservatives and added ingredients. Add exact measurements or heaping spoonfuls and I do, it depends on your taste. 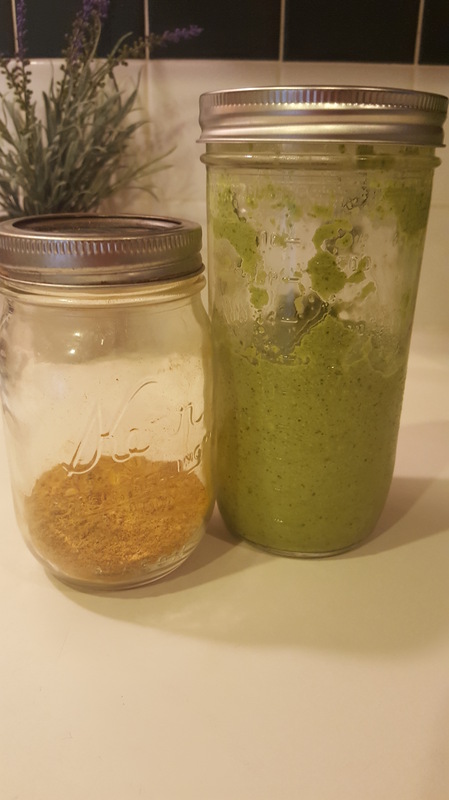 Mix completely in a mason jar. This Pernil costs less than $20 and will feed about 8 people or more depending on the size. It will last you for several different dishes. The ingredients were all things we normally keep on hand. If you don’t have some of the ingredients, find those plastic envelopes of spices that you can find in the Spanish aisle hanging on the shelf. The envelopes are much cheaper than buying a whole container in the normal spice section. They normally are around a dollar per plastic envelope. 3 cups of pan juice which was strained from the oils/liquid fat. You can use this to make gravy or use as broth. I love this topic! Food is my addiction and I love all of it. Now, my body will beg to differ, but with a few tips, meal planning and cooking throughout the week will be easy peasy. These tips won’t fit every lifestyle. I know some people we that use a butcher only, some practice husbandry or keeping of animals, and others like myself live in the city. We do what we can, but still need the grocery store. I’ve tried freezer meals only to have the freezer go out and spoil everything. I’ve tried shopping once a month to avoid traveling so much. This by far has been the best method we’ve tried to reduce our food budget. When taking a look at finances, you get a glimpse for where your money is going. Our food budget was killing our overall budget. So we made changes. Having a plan for what you will prepare for the upcoming week or few weeks can dramatically reduce your food bill. Why? Because by going shopping with a list and being prepared, you are less likely to buy things that are not on the list and potentially blowing your budget. It is like going to a car dealership with no idea on what you are looking at and test driving everything. It takes time and ultimately can produce a negative consequence like buying a vehicle impulsively without research of safety ratings and book value. Food is no different. There are so many choices that are highly processed and overly priced. Planning meals allows you to scout sales in market ads, dig in to those cookbooks you never use, and will influence the number of times you go out for take out. You are trying new recipes or bringing back recipes you haven’t made in awhile. Often, grocery stores have weekly flyers that are included in your mailbox or an email subscription of weekly deals. I typically have three stores I frequent. One being Winco, a bulk store that sells bulk or bigger packaged items, combined with Aldi, and lastly Sprouts which is a much cheaper version of Whole Foods. Combining stores in your grocery haul gives the best value, the best selection, without breaking the bank. This is only doable if the stores are in close proximity to each other, otherwise you’ll spend a lot in gas. If I shopped my entire list at Sprouts, I’d exceed my budget three times. If I shopped all at Winco, we wouldn’t get organic or whole food options. Yet Aldi, carries the cheapest canned goods and doesn’t carry for example Quinoa or a variety of fresh fish. Buying local from a farmers market or small produce stand is doing more than you realize. You are helping a local farmer pay his bills versus shopping at a commercial store where if you stop shopping there, it makes no difference at all. Local is always better quality and allows you to open up dialog to know where the items are coming from, how they grow them, and you learn a lot about the food you eat. If we go to a farmers market, often I can buy twice as much for the same price I’d pay at a chain store. Whether you create a handwritten list or use a cheat sheet like I do where the categories are separated with like items to just check mark what I need, a list is crucial if you want to stay on budget. There are many printables online or on Pinterest to choose from that are free. Going in blind leads to overspending. When running out of an item, keep the grocery list close by and always in the same place. In fact, it is above my trash can so as I throw something away, I add it to my list especially if it is a staple or pantry item. The only thing I don’t add to my list is veggies, fruit, and meats because that depends on sales and the meals I plan. This is so very important! Often we are so busy and pressed for time that it is hard to come up with a meal that fancies everyone on the fly. It is easy to say “ok, lets have macaroni and cheese again” leaving you bored and much more likely to go out to eat. We need variety and food shouldn’t be mundane. I keep a collection of cookbooks that gives numerous recipes to choose from. Keep it simple! If you want to try a recipe, mark it with a sticky note. If you’ve already made the recipe and it was a hit, make notes directly in the cookbook. What you added extra, did you alter something? how was it? It is good reference for next time. When you make the recipe, the sticky comes out. Making a list really does nothing unless it is organized. I keep three of my grocery cheat sheets, one for each store and put items on that list I know I get at that particular store. On the back of one sheet I write 7 meals and a few lunch ideas. The 7 meals are bookmarked in the cookbooks. Refer to the list when you cook and cross off when dinner is done. Write notes next to the recipe such as a happy face if it was a hit or sad face if it was a fail, then take out the sticky note, and put the cookbook away for next time. Our food budget without this method was topping $1100 or more each month and included eating out. It was so easy to not feel like cooking because I had no idea on how to piece together various items to make a full meal, so we’d say the heck with it and go out. Since starting this method, our new food budget is on average $600-700 a month. We have two adults, a 14 year old teen in sports, and a 20 year old who worksout everyday. So trust me when I say that we can eat! Even if you don’t try every tip, trying one will make a difference and will inspire you to do more. All you need to do is try one. With the time it takes to prepare your list and meal plan it’s equivalent to one night eating out. So what do you have to lose? Worms, pets, gnats, you name it, are quite bothersome and most annoying in a home garden. After all, it takes effort and planning to garden and is not an easy feat to get rid of what ails it. Pests come and go and there is every chemical on the market to get rid of them. What is hard to comprehend, is why put a chemical on your garden when if you are like me, your garden is organic and made with homemade compost. It defeats the purpose. 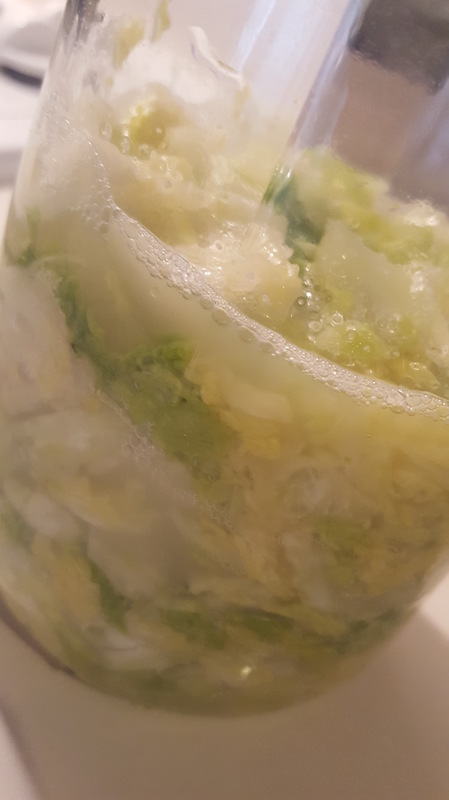 Most recently, it was discovered that cabbage worms have made their beds among the baby brussel sprout plants. Here is how to make your own inexpensive “Worm Spray”. Take an empty spray bottle and fill 3/4 with water. With a teaspoon, measure two teaspoons of juice or water from your minced garlic jar. 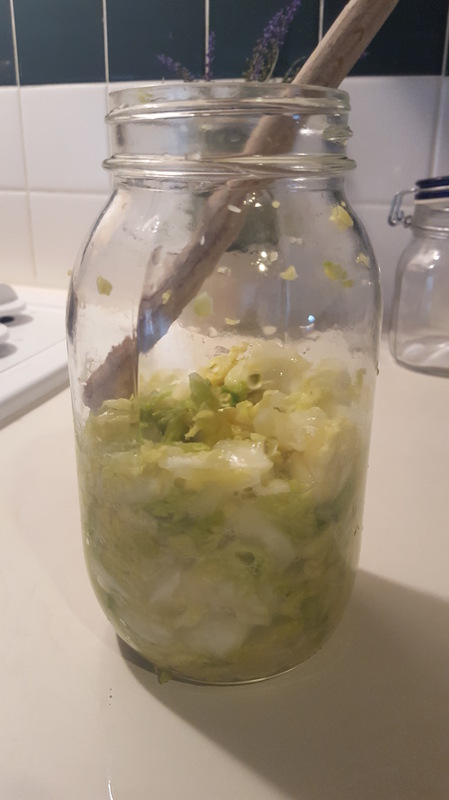 To make a homemade version if you don’t buy jarred garlic, mince a clove of garlic and add water letting it infuse in the fridge for a few days. That garlic acts as a deterant for the butterfly so they don’t land on the leaves to lay eggs. Pierce a few fish oil capsules and empty in the bottle. I would highly recommend wearing gloves for this because the fish oil smell lingers on the skin. Yuk! Two liberal applications emptied the spray bottle so there is no waste depending on the size of the area you are spraying. I had just four plants. Shake and spray! It is that easy. It smelled like fish, but was very effective. It took about two applications within a week avoiding watering the leaves, but rather let the water run near the stem to not wash off the mixture. It has been about two weeks and the plants show no signs of new eggs or new worms. I’m not sure if this remedy will work on all plants. 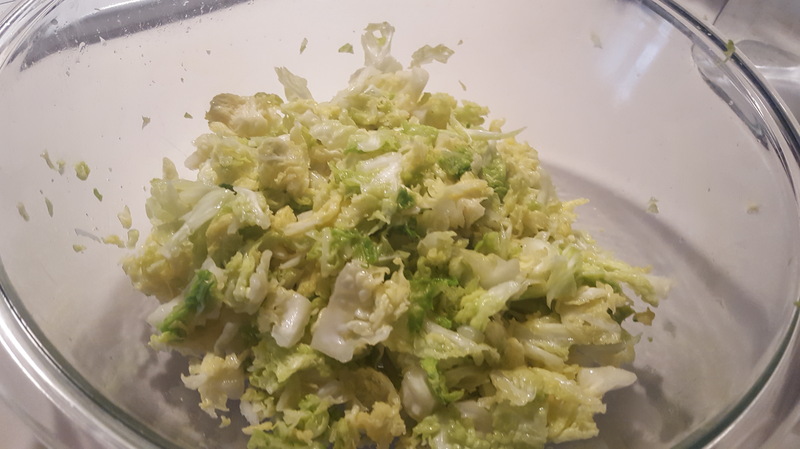 But for brussel sprouts it worked like a charm. Cabbage worms seem to love really green veggies like broccoli, cabbage, and brussel sprouts. Best part is most people already have the ingredients in their home making it a very affordable option. Total cost for this little project was .50 for the travel size spray bottle.